SLP unveiled the details of their new ZL550 & ZL575 Camaro packages at Carlisle recently. The packages include a 2300 series TVS Supercharger, suspension, appearance updates, and much more. Check out slpcamaro.com for all the details! Take a look at this stealth like 2010 Camaro LT V6 model. Looks like one county in Texas has a sneaky Police vehicle running the streets - keep your eyes out for this one. The Nickey shop car is coming along nicely. They recently installed the new Stinger hood on the 2010 Camaro SS. This was posted on 5thgen.org this week! The all-new 2010 Camaro is a stellar performer straight off the showroom floor, but like most modern muscle cars it suffers from significant body roll and understeer. Whether it's a Super Sport, Rally Sport or V6 model, installing a bolt-on Hotchkis Sport Sway Set is one of the fastest, easiest and most dramatic modifications you can make to the new Camaro. Significantly improve handling, driver control and overall fun factor in less than an hour with basic hand tools. Available for all 2010 Camaros, the system includes a track-tested, high-strength tubular steel 1.25-inch front bar (210% stiffer than stock SS) and three-way adjustable 1.00-inch rear bar (+80, 120 or 170% stiffer than stock SS) that allows you to dial-in the way the car responds to throttle steer and driver input. Finished in durable gloss black powdercoat, the bars also include mounts, greasable Polyurethane bushings, all necessary hardware and complete installation instruction. 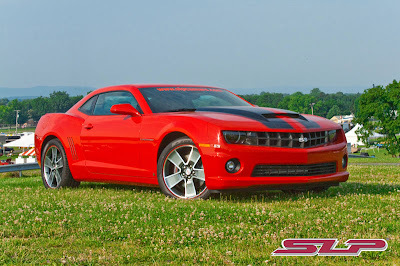 Like all Hotchkis products, 2010 Camaro Sport Sway Bars are designed, tested and manufactured in the USA. Reduces body roll, improves handling, steering response and control. Looks like Proformance Industries has come up with an updated version of the classic Chevy Rally Wheel. Saw this posted on Jalopnik and 5thgen.org today, spotted outside the Avis at DFW airport. This V6 Camaro had just over 1,000 miles on the clock. Edmunds InsideLine says forget about bankruptcy. GM's big problem is the 2010 Chevrolet Camaro. The fools in the Center of Renaissance aren't building enough of them. They need to be cranking out more badass versions of their new red-hot hot rod; like right now. You know, before Obama and the Green Brigade take it away from us. The Camaro needs saving. Here are their brilliant ideas how to save it. From 1978 through 2002, Chevy offered the Camaro with translucent T-tops. That's 25 model years! T-tops are as much a part of Camaro heritage as high school parking lot burnouts, and it's inexcusable that the Camaro has returned without them. First off, I'd like to thank you for being a GM customer. Your current and future business means a lot to us. Given all of the recent media coverage about GM, I am writing you today to address some questions you may have, and to assure you that we are here to stay and ready to serve you. Your GM Warranty — Rest assured, we will honor the warranty commitment given to you at the time of your purchase. Our GM Dealers are very much open for business, and ready to meet your sales and service needs. And even though we are seeking buyers for our Saturn and Saab brands, have just announced the selection of a buyer for the HUMMER brand, and have decided to eventually phase out Pontiac, those dealerships also remain open and ready for service. The bottom line is your warranty will be honored and service will always be available through authorized GM retail facilities by GM-trained Goodwrench experts, with Genuine GM Parts on hand. Your Next GM Vehicle — At this, the most important moment in the history of our company, our dedication to high-quality, fuel-efficient and outstanding-value vehicles has never been greater. As I said before, our GM dealerships are very much open for business, and banks and credit unions are lending and continue to offer some of the best rates available to qualified buyers. 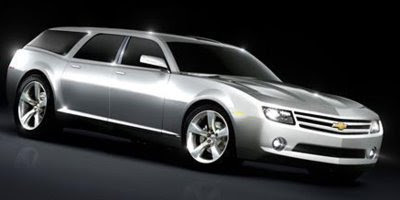 To find information about GM dealerships in your area, please visit www.GM.com/vehicles/dealer. Your General Motors — For over 100 years, GM has fueled America's passion for the automobile. Propelled by the spirit and commitment of our people, we will become the New GM, a company that makes Americans proud, and one that can compete successfully with anyone in the world. All of us at GM are confident that we will emerge a leaner, stronger company for you, offering the most compelling vehicles possible from our Chevrolet, Buick, GMC and Cadillac brands. I invite you to stay up to date on our promising new future by visiting www.GMreinvention.com. As I said at the outset, we are genuinely grateful for your business, and we hope that you'll stay with us. If you are considering buying a new vehicle, please review a special offer for our owners. Then, visit www.GM.com/owner to see how this can be combined with other current incentives — it's our way of saying "Thank You" for your ongoing support. This GM owned 2010 Camaro 1LT has some visitors in the night earlier this week. 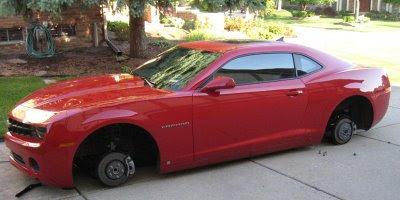 Parked in a nice neighborhood just north of Detroit, Michigan, this Camaro had her shoes taken from her. 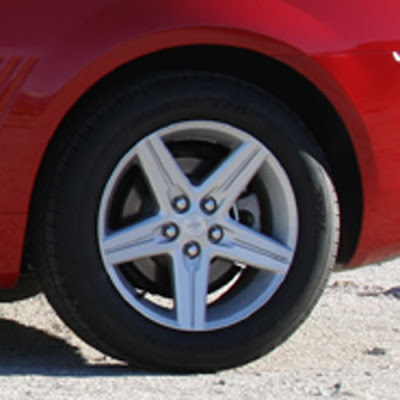 This is a V6 car with the 18 inch wheels shown above, more than likely striped of the tires and scrapped someplace. 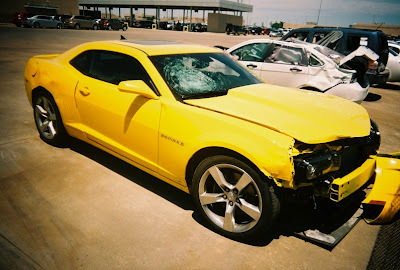 We have already seen the first totalled Camaro, maybe the first case of stolen wheels, we hope this one is repaired and back on the road soon!